Chives (Allium schoenoprasum) are among the world’s most versatile and prolific herb plants. 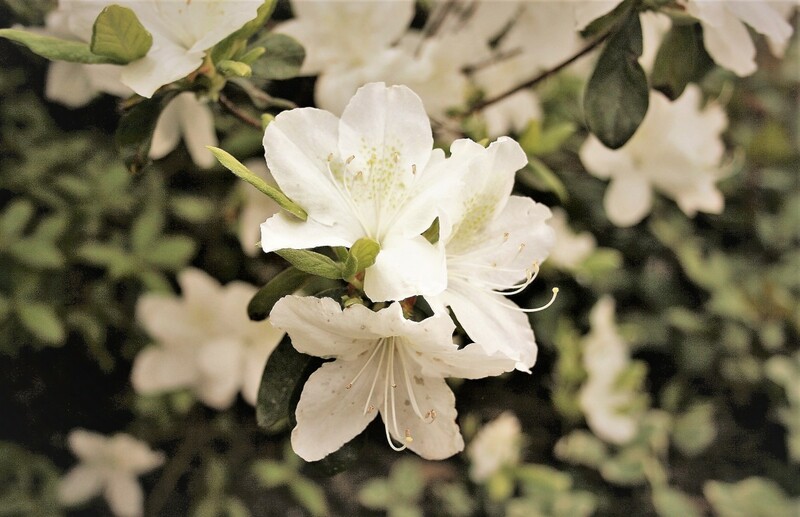 Native to India and China and dispersed through centuries throughout the world, they are beautiful, hardy, tasty, good for your health, and very easy to grow. Chive plants ask for so little while they give so much, to the point of taking over your garden with their quick-growing seedlings if you let them. Chives are so versatile that they can be inspiration for countless projects and money-making, money-saving adventures. Here are 10 inspiring ideas for using chive plants. Chives hold ornamental interest throughout their growing season, spring through fall. 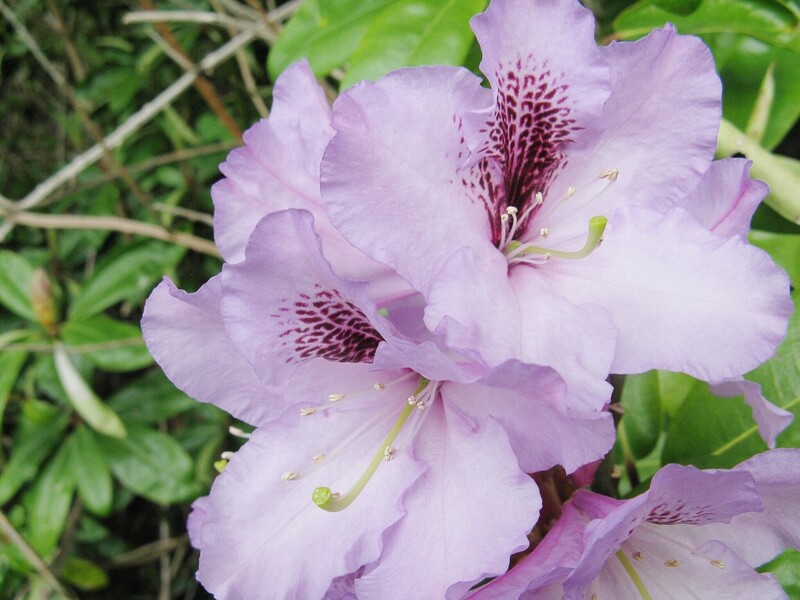 In the late spring, the plants are loaded with delicate pale to deep lavender-colored flowers. If you harvest the chive plants after their first bloom by cutting all or part of each plant back to within one-half inch of the soil surface, the plant will grow new foliage, and flowers as well, although in lesser profusion, throughout the summer. 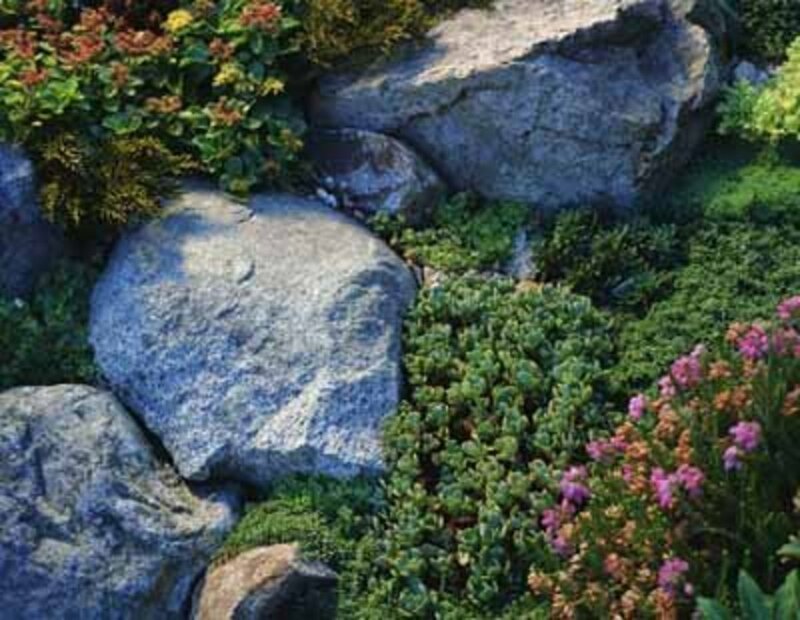 Plant chives in rock gardens or on hills to minimize soil erosion. Barring a flood or mudslide, the mature chive plant’s dense root mass will anchor your slope in place. Since chive plants reseed so easily, you need not interfere with their reproductive process unless they are too prolific and start choking each other off, in which case you want to thin them out. 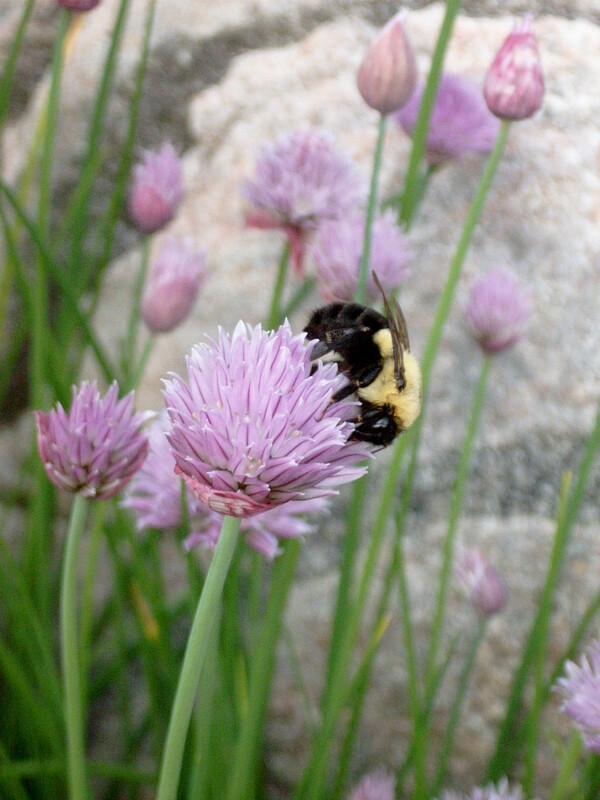 Grow chives as companion plants in your vegetable and rose gardens to encourage bees and healthy plant growth and to discourage pests and diseases. Chives planted close to carrots encourage bigger carrots. Chives planted among roses discourage black spot and aphids. To control downy and powdery mildew, make a chive tea by boiling freshly chopped chive leaves in water. 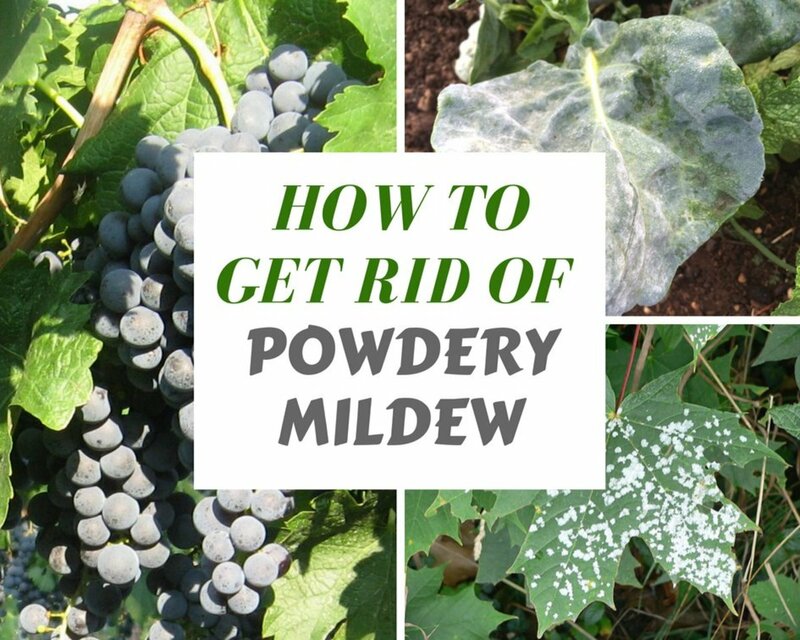 Cool the tea and spray on flower and vegetable plants susceptible to mildew infestations. Use chive greens to flavor salads, egg dishes, baked potatoes, fish, soups, and more. Chive leaves add a mild fresh onion taste and also enhance the natural flavors of the food to which they are added. You can also add fresh chive to softened cream cheese or butter for a delightful bread or bagel spread. Chop the long, slender chive greens with a knife or snip with scissors. When adding chives to hot foods, add them immediately before serving so that they remain fresh and green and retain their subtle flavor. Photo by Sally's Trove. 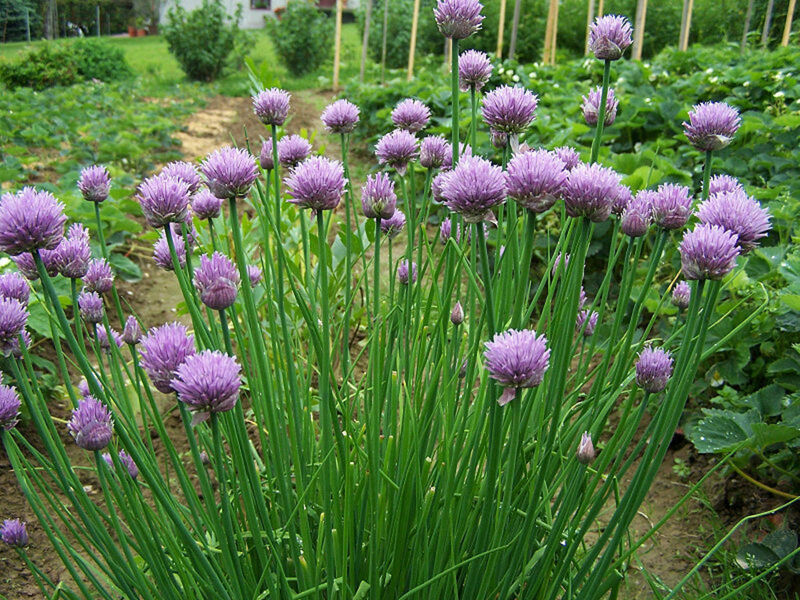 Chive flowers taste almost like freshly ground peppercorns, but with an added mild onion flavor. The beautiful lavender chive flower is edible. Add young chive flowers (ones which have not yet set seeds), whole or separated into individual florets, to a fresh green salad for a pleasant, quite spicy-hot flavoring. You can also add young chive flowers to plain white vinegar. The resulting concoction will be rosy in color and tantalizingly flavored. If you love deviled eggs as I do, try this wonderful spicy, dicey, chivey deviled egg recipe from the Chestnut School of Herbal Medicine. Although chives can be dried for storage, they lose much of their delicate savory nature in the process. Instead of drying chives and storing them in jars (or buying expensive dried chive in the grocery store), snip or chop the chive leaves, spread them in a single layer on a flat baking sheet and put them uncovered in the freezer. When frozen and brittle, pour them into plastic freezer bags, removing as much air as possible, and seal tightly. Packaged this way, frozen chives will last in the freezer throughout the cold winter. When you want to use them, just pour out the amount you want from the freezer bag, let them thaw a bit, and then add them to foods as you would freshly picked chives. In the spring, when the chive flowers are at their most beautiful and abundant, freeze whole chive flowers into individual ice cubes for a beautiful addition to a cold summer drink. Think about adding these sensational ice cubes to a drink like Cranberry Rosé, or to a tall glass of sparkling water. Photo by Sally's Trove. The airy pastel quality of the chive flower blends with peony and climbing hydrangea. Photo by Sally's Trove. The hard angles and dull darkness of the chive seed give no hint of the airy pastel flowers and rich green leaves to come. 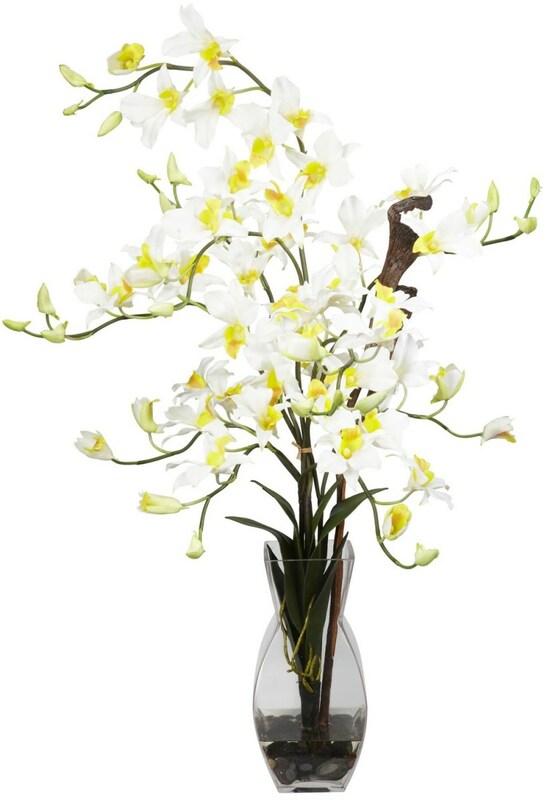 The sturdy, hollow stem supporting the chive flower retains its rigor when cut and placed in water. 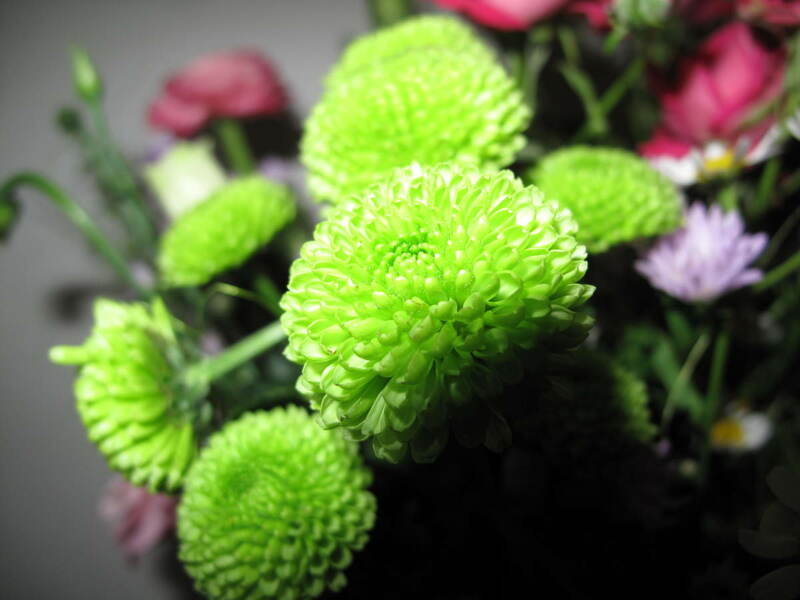 Chive flowers add a soothing pastel color and a light and airy feel to spring-time flower arrangements. 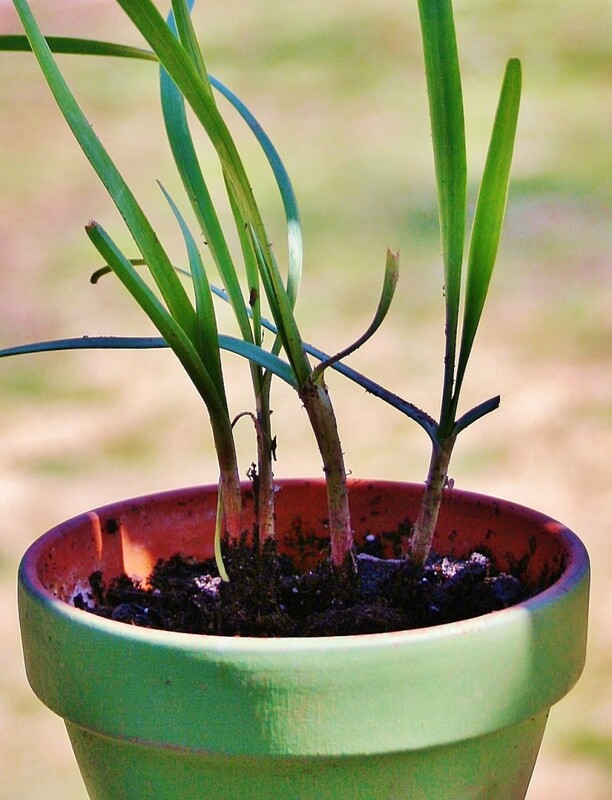 Grow chives from your own harvested seed in pots to give as gifts. Chive flowers produce enormous amounts of seed which can be easily shaken out of their drying petals. 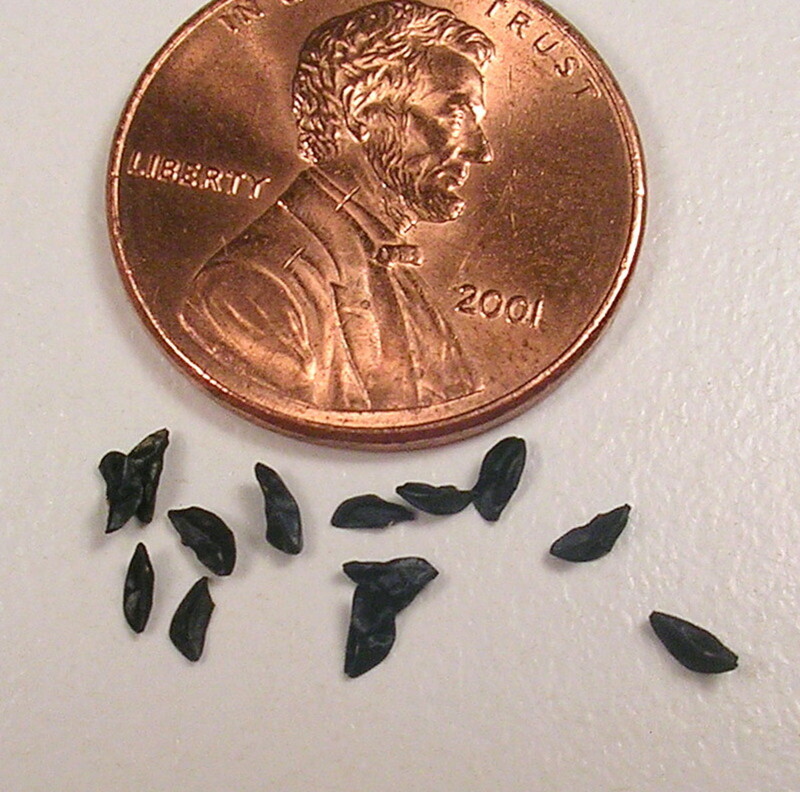 The seeds sprout easily when they are planted in a moist growing medium and set on a sunny windowsill. I don’t know any cook who wouldn’t welcome such a gift, nor any chive grower who wouldn’t be pleased to save money with this adventure. Once chive plants are thriving in your gardens and ornamental borders, you will have more chive than you can use. Make a few phone calls or visits to local restaurants or markets to see if they are interested in purchasing your surplus. You might be surprised at the enthusiastic reception you receive. Now there’s an idea you can use to make money! Wadoods, thank you for your kind words and informative comment. Derdriu, thank you so much for your gracious comment. Yes indeed, we are fellow-chive lovers! Sally's Trove, Chive-time is one of my favorite times, in terms of appreciating the bloom, the culinary contributions, the erosion control, and the planted possibilities for oneself and as gifts for friends. Bless you Sally, we may miles apart but at least we can make each other laugh. That's what is all about. If you can't whole brussels try peeling the leaves off and gently cook like cabbage, they don't taste so strong. LOL, Gloshei, what a great comment. Brussels' sprouts won't do it for me (although I do love them). Now, if I can convince my daughter that she might be traded in a friendly way for bacon and potatoes, she just might visit you. Awesome! Thanks for putting a smile on my face. Thanks Sally it may be late for me this year but next year this is a must, just get some brussel sprouts. Don't sell your child I will swap for a couple of days so you can have those potatoes!!! Gloshei, chopped chives on mashed potatoes? I'd die for that! My diet is restricted to no carbs, only greens and other low- or no-carb veggies. I'd sell my only child right now for chives on a potato. If I'm going to sell my child, I'd like bacon too, please. About chives as a pest repellent, rabbits don't like chives. I've found that planting a border of chives around plants that rabbits like works well to keep the rabbits out...sort of like a chive fence. wadoods, thank you for your thoughtful comment. You covered a lot of territory. Many of our western herbs came from Asia, certainly from India. It is interesting that western cooking may have more culinary understanding of herbs than Indian cooking. Thank you for your advice on growing chive and preserving its greens in ice. A very interesting hub Sally I love chives and give such a delicate flavour. Only yesterday I chopped some up and put in the freezer for later, and I also mixed some with my mash potatoes for dinner. 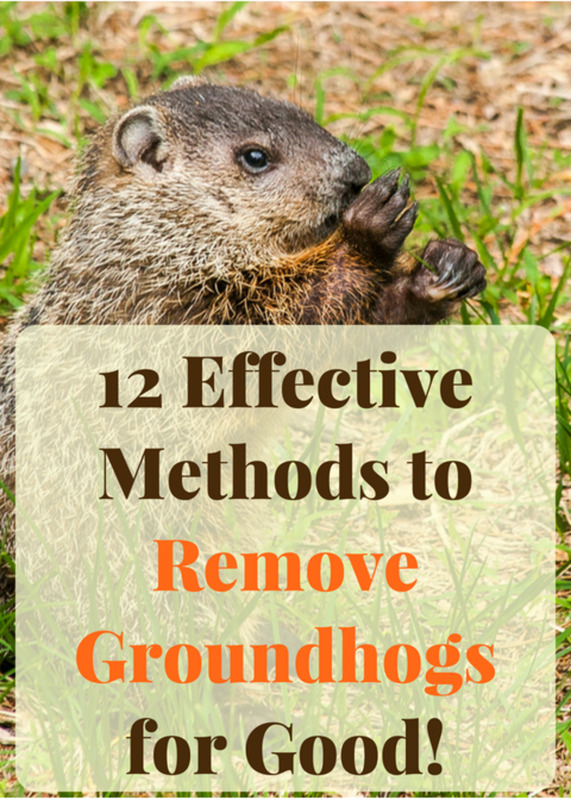 I must admit I did not know about them being a pest repellent this is useful. It was na omen when I saw this hub, voted up and bookmarked. I introduced Chives ((Allium schoenoprasum) in my kitchen garden under the herb sector in 2004.I have been using the foliage of the plant ever since. I have distributed the growing stock to number of my friends and foes free of cost, primarily to introduce the flavor of the wonderful herb to the common gardeners and nongardeners.It should be divided after 2nd year or else it becomes forms thick mat its growth is also retarded. Division and space availability makes it happy. The herb can be preserved by crushing in a mixer with cold water, It forms a viscous green liquid .This liquid can be stored in ice cube form in the fridge. moonlake, one of the delights I have in the garden is eating the fresh chive sprouts when they start to grow in places I don't want them. The seeds go everywhere! So when I see some shoots in places they shouldn't be, I pick them and eat them. I love chive plants we have in our garden and in with the flowers. I was just outside yesterday taking pictures of them. I eat them right in the garden and like to use them in our food. Voted Up. I love eating chives did not realize that they were so easy to grow and had so many uses. You have made me a believer I will now grow chives! :) GREAT HUB! What a great hub! I have chives in my garden and I love how beautiful they are and how they attract bees. Plus, I love adding them to food. I've never eaten the flower, though. I'll have to try that and some of your other great ideas! ThriftyBoomer, there are plenty of gardeners on HP. I hope you enjoy discovering them. TY so much for your good words. Great hub! 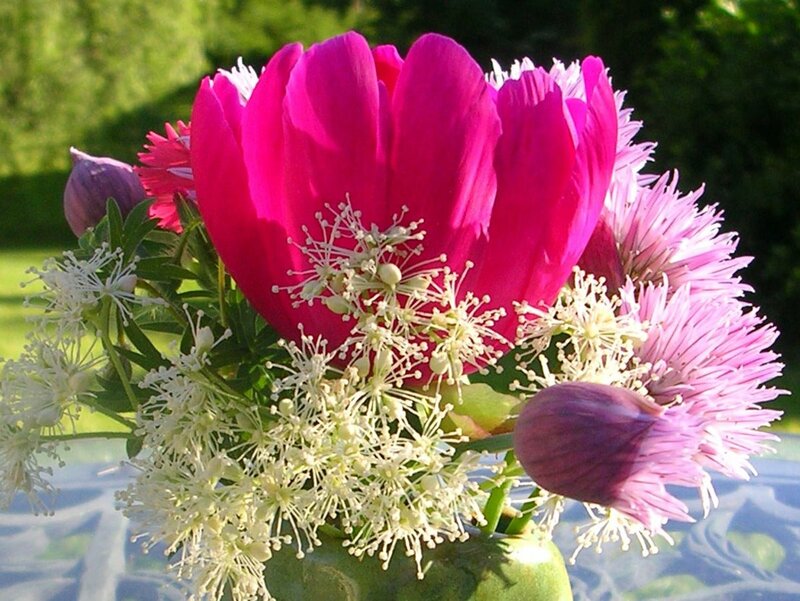 Freezing chive flowers is a wonderful idea! I can already picture a carafe of ice-cold water with chive-cubes. It's a perfect centerpiece for brunch. Thanks for the innovative ideas on making the best use of herbs! This is a really informative hub. Glad to know there are other gardeners on Hubpages. tillsontitan, enjoy the flowers as food. They are delicious...spicy, fresh, peppery, and beautiful in a salad. I always pick them apart...I learned from experience that eating an entire chive flower is more pepper sensation than I want. :) So glad, as a fellow chive grower, you found this useful. You provided a lot of information on chives I was unaware of. I've been growing them for years but never knew you should cut them back after they flower, nor did I know you could eat the flowers! Thanks so much for this helpful information. Voted up, interesting and useful. I have seeds I haven't planted. I don't think it's too late, is it? Chives are so pretty; I don't know why I haven't planted them before. Lovely hub. Many votes! Wow, I just learned a lot. These grow wild in a near town I pass and did not know it had many uses. I will definitely get some and see how I can use them for cooking purposes. In the vinegar sounds great. TY for this Hub. Edible they are, and quite spicy, too! In addition to using the whole flower for flavor or decoration, you can pull apart the individual florets and sprinkle them on a dish, like snow! I did not know that the chive flowers are edible. It is a great idea to decorate the dishes! Marisue, so interesting what you said about "bite a bloom". Trish was here last weekend and there were a couple of new blossoms on the chive plants. She'd never "bitten" them before, and she loved it! Just a bit of warning...take the young flowers apart and bite their pieces, and take them apart when you add them to a salad. 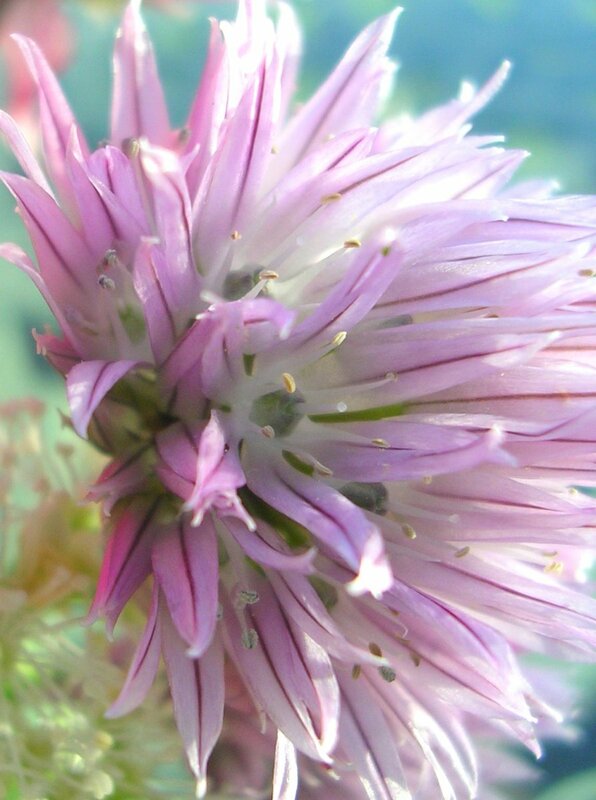 A whole chive flower might make the mouth burn! Wow,this is so interesting! Trust you to know all the ins and outs of Chives. I didn't know 3/4 of these yummy facts. I'm going to add them to my garden next year! I will even bite a bloom! Your photos are beautiful, a second calling for you? Pcunix, you are welcome. So glad you found some new uses for chives! Thank you. We have been growing chives for years, but never knew all this! Love to hear from a chive lover. Thanks for the good words, habee. I love chives and often grow my own. Great info! Dolores, I think you'll really enjoy this addition to a salad. Thanks for reading and commenting! Sally, we have some chive growing around the side of the house and I do love the pretty flowers but never thought to add them to a salad. That would be so pretty! Look forward to trying that! Bob, thank you for the compliment. I'm happy to know there are others out there who just can't get enough of chive. BkCreative, I used to have a very large garden as well as a small family Italian restaurant a few blocks from my house. Not only did I earn a few bucks for my surplus herbs, I also went home with a lot of free, fresh, homemade, ready-to-cook pasta. Yes, this is a great opportunity for herb growers of any size to cash in on the desire to claim freshness. I love chives - and fortunately my daughter-in-law has a ton in her garden. Your last idea was absolutely brilliant - to sell some. With more and more restaurants wanting to claim freshness - this is very clever. Great hub and rated up of course! Zsuzsy, I'm so glad you mentioned the coffee grounds. Usually, I add them to the compost pile, but I think I'll reserve at least some of them for the chives. And since I drink my coffee black and plain, and rarely finish a cup, the cold dregs are going to the chives! I like what you said about the geraniums and chives together. Chive flowers and leaves lend a tremendous visual appeal in the garden, complementing many other flowers with their grass-like aspect and gorgeous flowers, flowers which can continue to bloom all season long. Thanks so much for adding your experience here. All the best to you and yours! Wendy, thanks for the good words. Maybe you'll try freezing some of your summer garden chives for winter use? It's really easy to do. Just make sure they are dry before they go on that baking sheet and into the freezer. Mulberry, I'm glad you got some new and useful information here. Thanks so much for your comment. Chives will be going into new gardens both shared garden and small one at home. I have been adding them to gardens for years now and find them most useful. Thanks for a great hub. Some of my chives are growing right along the geraniums. Both are blooming and it looks awesome right now... the lavender flowers of the chives next to the orange red geraniums. gorgeous. My grandpa used to add all the coffee grounds to the chives and geraniums. The Chives grew huge in his garden, they also loved left over cold coffee. Linda, I'm glad you enjoyed this info. You were the inspiration for it. I'd started writing a Hub on growing succulents outdoors, as you suggested in your indoor succulents and cacti Hub, when I got distracted by the bee activity on the newly blooming chive, and look what happened! Peggy, you bring up a good point. Sometimes you have to experiment to find the ideal place to grow a particular plant. About the invasive mint, a neighbor of mine grows spearmint and chocolate mint in a huge terracotta-colored plastic pot on her patio. We are zone 6 here, and her mint has been thriving for years without being in the ground. It's a great way to contain those runners. Fabulous tips for using chives. I love the flavor and I know the flowers are pretty, but I learned a lot more about them that I didn't know. I use chives a lot. More in the summer since they are growing in my garden. Nice Job. I have always loved chives on baked potatoes, but never gave them much thought beyond that. Until I read this hub, that is! This is great- There are so many interesting ideas and useful bits of information in here that I can't wait to explore, and since I love to make my own oils and vinegars, first up will be chive flowers in vinegar. Bookmarked and thumbs up! It took a while to find a spot where the chives wanted to grow and thrive in our home...but we finally have found the perfect spot. The garlic chives and regular chives are now companions...just have to keep pulling the invading mint out of the area! We love herbs and have many different types growing in our garden. Never thought of pairing chives with our roses...but may give it a try. Thanks! Annemaeve, what a cool idea about tossing seeds on the turnpike...but we'd have to pick one of the wildflower patches that don't get mowed down except every second or third year. Can't you picture Mom tossing the seeds out the window on the way to Aunt Katie's!!!! You just came up with Use Number 11. Thank you, sweetie. Om Paramapoonya, you won't be disappointed with those beautiful ice cubes. You can also freeze them into larger containers of water (like a gelatin mold, for example) and float the ice blocks in a punch bowl. Have fun! What a fun read, Sally! You know I'm not your chive person, but they're just so darn pretty in those pictures! I suddenly want to plant them everywhere, and not just because I know they thrive on neglect. Ooooo we should throw seeds out the window next time we get on the turnpike! I think chives would complement the ornamental grasses on that slope very nicely. And that picture of the seeds is AWESOME! You are the true mistress of my camera, my dear. And thank you! You've got an email from me coming your way with more info about growing chives in Texas. Sally's Trove, thank you for doing some research for me. In fact, it occurred to me that I need to pass along a link to your hub to a friend of mine who enjoys gardening as I do. And your extra bit of research will be helpful to her. Thank you!! Frieda, your last comment lit a light bulb over my head. When I first started growing roses, I just planted chive around them because I liked the contrasts, just like your mom does. Now I'm wondering if roses and chives don't send out some mysterious energy, like something that could be received by a sixth or seventh human sense, that actually makes us pair them up. What fun! Habby, after you asked your question about how chives would do in the Texas heat, I did a little research, since I've never grown chives in a climate that doesn't have a cold winter. It seems as though you should be able to grow chives nicely as long as their requirements for well drained soil and ample water are met. They may not perform as predictably as they do further north (their estimated best growing zones are 3 through 9), but they should live and prosper, producing both greens and flowers, perhaps on odd schedules. When you get around to planting them, start with potted young plants instead of seeds, and try different areas around your house and yard...full sun or partial shade for example. Glad you enjoyed this Hub and that chives may play a bigger part in your family's life. They have so much to offer! I told my mom about your article today and she said, you mean to tell me that the reason my roses are doing so well is because of the chives I planted? She said I have to go get some right away. She hadn't planted them intentionally, just thought they looked wonderful nearby. lol. So yes, she attests that it's a rose-saver. So I suppose I'll be buying some tomorrow. My roses are white and I have some red and purple flowers near, so the chives will work with the landscaping just beautifully. Wanted to thank you again for this helpful article. Sally's Trove, you are an excellent, engaging writer! Thank you for a wonderful hub about a little plant that most people, including me, only use on their baked potatoes. You have enlightened me, and I am eager to use my new "chive" know how in my own garden! P.S. How would chives do in the Texas heat? Trish, thank you for your encouragement. Guess I was having a mind f**t questioning why this Hub ought to be written. Your enthusiasm for the idea was the push I needed. In fact, as I began to get serious about it because of you, I found my self migrating from, "Ho-hum, who cares, everybody knows this," to, "Son of a gun, I've actually got at least 15 uses!" But 10 seemed to be the better number. And, as it turns out, look at all the rich comments! I'm so glad you went ahead with this hub. I've learned a lot from this, even though I will never be a gardener. I think my favorite taste is cream cheese and chives. Sadly, the kind I've had was store-bought. Nellieanna, thank you for sharing this tender and beautifully told story. Your words should dispel any doubt about the powerful persistence of Allium tuberosum, and the same may be said about Allium schoenoprasum. FP and Sally...they are known as choti pyaz(little onions) in India and yes I have seen it made as a full dish on its own. Didn't try tasting it though. I had the garlic chives in my herb garden that threatened to take over Planet Earth! They were very tasty - but so prolific! I've dried, frozen and just grabbed handfulls and eaten them! But then, after my darling late husband went outside one day and removed all the logs from around all the remainders of the veggie garden - and then around my still thriving herb garden, I became a bit alarmed. But he was going into dementia and I sensed that it was something he felt he must do, perhaps worrying about my having to care for it all alone when he could no longer do his major part - he was the main veggie gardener. I always tended to my herbs and helped with the veggies. Then the next thing that happened was he was out with the mower mowing down my herbs. The grass had already overtaken where the veggie garden had been but the chives, oregano, borage and comfrey were still holding their own. But - it was too late to stop the cutting by the time I looked out and saw. What was really amazing was that after he no longer was up to mowing, even right after the lawn boy cut the grass - for a long period of time, remains of the chives quickly and valiantly tried to hold forth. The first growth very quickly after a mowing was always the garlic chives! George would look out the patio door and comment that the lawn needed cutting! I had to constantly reassure him it was not the grass growing so fast but the chives! I can't think of chives without vivid memories - the lush greenery of the leaves (much wider than regular chives), the garlicky aroma when they were cut or trimmed - the wonderful addition to soups and other dishes -- even their healthy tasting mouthfulls, like getting one's chlorophyll fix for the day! Thanks for giving me not only some new looks at chives' uses but a stroll down memory lane. D.A.L., thanks for the good words. I enjoyed taking those pictures yesterday and then finding the one with the bee. Chives are full of opportunities, and I hope the pics contributed to conveying that idea. Frieda, I'm so glad you want to try planting chive around your roses. I don't know what ants think of chive...perhaps they don't care for it either! As for aesthetics, the chive and roses will come into their first blooms at pretty much the same time. No matter what color your roses are, the delicate chive flower and grass-like foliage are gorgeous color and texture complements to the full flower and deep green shiny flat leaf of the rose. Your plan sounds great! Sally, really enjoyed this well written informative hub. Pictures enhance your work. Dear sally thank you for sharing this amazing hub with us all.Back in BC Canada we would use Chives alot for our meals as well as garlic *S*. your amazing keep up the great work. Awesome hub! I have roses along the front of my porch at home and they do suffer at times from black spots and aphids (the latter not helped at all by the millions of ants in my yard). The chives would look absolutely gorgeous near there. I'm going to definitely give this a try asap. Thanks so much. Darlene and Hello, thank you for your good words. I got inspired to write this Hub when I recently waged war in my garden on a number of killing weeds and found that the chives were among the few plants that survived being strangled by those hideous weeds. Nothing like almost losing something to make you appreciate it more! So I got to thinking about all I would miss if the chive plants hadn't made it, and thus the 10 uses. Diana and FP, Allium schoenoprasum is actually native to India and China, and it is thought that Marco Polo brought this Herb to the West. I've never seen anyone make a whole dish of chives, but I think it might be interesting to try, plus it would be nutritious and definitely low-cal. FP, I do have a particular passion for onions...I remember our early back-and-forth about onions in Polish and Indian households! You wrote an excellent hub with so much information and many tips. Thank you. a very informative hub and I loved the pictures. I don't use chives very much, but here in India, I have seen people even making a full dish of it, not just as a seasoning.